Featuring “Run” and “The Sky Is A Neighborhood”, the former reaching #1 on the Active Rock survey, the new album from these rock giants should be in the running for #1 on next week’s Billboard 200. The group last debuted atop the album chart in 2011. We’ll see you next week for new albums from Chris Janson, Fergie, Macklemore, The Killers and more. Listen to the PGTC Friday Faves list on Spotify! “Something” to contend for #1. Other releases out this week include: Big K.R.I.T.‘s Cadillactica (iTunes), Bobby Shmurda‘s Shmurda She Wrote (EP) (iTunes), BØRNS‘s Candy (EP) (iTunes), Damien Rice‘s My Favourite Faded Fantasy (iTunes), G-Unit‘s The Beauty Of Independence (EP) (iTunes), Hail Mary Mallon‘s Bestiary (iTunes), Machine Head‘s Bloodstone & Diamonds (iTunes), Queen‘s Forever (iTunes), Röyksopp‘s The Inevitable End (iTunes), The New Basement Tapes‘s Lost On The River (iTunes), Whitney Houston‘s Her Greatest Performances (Live) (iTunes) and the Zac Brown Band‘s Greatest Hits So Far… (iTunes). One Direction has more than Four reasons to be #1 next week (after all, there’s five of them in the band) and they will be facing some hot soundtracks from Annie and The Hunger Games: Mockingjay, Part 1 along the way. See you next Sunday for the full details… may the odds be ever in their favor. This pint-sized pop ditty became the last CHR airplay hit for the younger sister of Jessica Simpson. Followup single “Invisible” became a digital hit, but didn’t gain any significant ground on the radio. Simpson is still making music today under an independent label. In 2001, Smash Mouth had a hit remake of The Monkees‘ “I’m A Believer”, featured in the movie Shrek, which was co-written by Neil Diamond. In turn, Diamond helped the band co-write this song, which became their last CHR hit. They’ve had a few minor Hot Adult Contemporary entries since then. The second coming of Hanson scored their first top-40 hit in 2007 with this song. They had several bigger hits in the years to come, including 2008’s “Burnin’ Up”. They reunited recently after two of the brothers pursued solo projects and the other got married, and look to have an album out in 2013. DJ Touché, born Theo Keating, scored his only hit in the United States when it was featured in an advertisement for Mitsubishi. Followup single “Ooh La La” had a little bit of airplay, but failed to make the top 40. Today, he records under the name Fake Blood. This is the only group with two songs on here. Originally a minor chart entry for ? and the Mysterians in 1967, the band updated this tune for the soundtrack to the film Can’t Hardly Wait, which starred Jennifer Love Hewitt. They would score their biggest success the following year in 1999 with the #1 hit “All Star”. These punk rockers went pop beginning in the late 90’s, when this song became a minor hit on the CHR survey. You probably remember the music video of them running around naked everywhere. The trio would score their biggest hit with their next single, “All The Small Things”, which hit #9 on the chart. The first single from To The Faithful Departed was a bit of a dud on CHR radio, mainly because the song was too hard for the mainstream listeners. However, two other singles from the album, “Free To Decide” and “When You’re Gone”, made the top 20. Singer-songwriter Rothberg has one of the more obscure songs on this list, which was featured on her debut album, Between The 1 And The 9. It was also a minor Alternative hit. If you couldn’t tell already, this was the theme song to the live action adaptation of the cartoon, which starred John Goodman as Fred Flintstone. The band also had a small cameo in the film. This was the band’s last CHR hit, though they’ve had a few releases since then, including a 2008 comeback single entitled “Funplex”, the title song from that album. Third time was the charm for this Scottish band; their third top-40 hit became a top ten record, peaking at #6 for three weeks. It also spent 37 weeks in the top 40. The band was dropped by their label in 2002 when no more big hits rolled in. From their debut self-titled release, this was the biggest crossover single for Dave Grohl in the boys, which was accompanied by a hilarious music video. The band would hit the CHR chart one other time in 1999 with “Learn To Fly”. 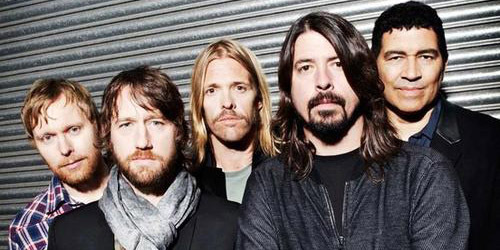 Grohl and the living members of Nirvana recently performed with Paul McCartney at a Hurricane Sandy relief concert. This Australian band managed to make a charting song under two minutes, an acoustic version of a single originally performed by New Order. They had several other big hits in their native Australia, but this was their only one to make the charts in the States. To keep things short, hope you’ve enjoyed this look back at the shortest songs to become radio hits, and keep an eye on “Ho Hey” to see if it keeps climbing or gets cut… you know… short. I’m here all week.